If you're planning a trip away in the UK, the Kingfisher Visitor Guide websites are a great way to discover more about the location you are looking to visit. 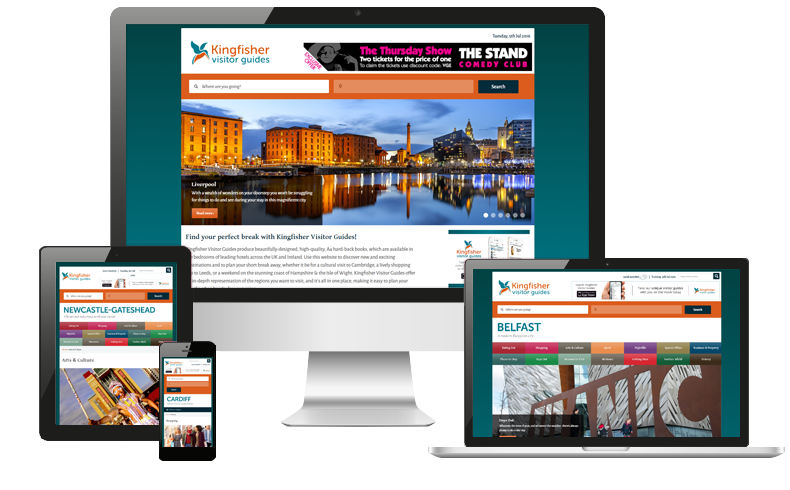 Kingfisher Media approached us when they were looking to create websites to support each of their existing visitor guide publications. The main requirement for this project was for the sites to transition from one to the other while still maintaining the design aesthetic of printed books. As the sites main focus is travel it was also important to create the websites to be mobile friendly so that visitors to the site can view them on the go. Working closely with the design team at Kingfisher we helped advise them on the best way to transition their printed publications into a digital website, first working on the sitemap and then the wireframes and look of the site. Once the design was approved we moved onto developing a base template that could be used across the portfolio of websites. As it was important for the sites to be easily manipulated to reflect the different publications, we developed the template using SASS which allowed for us to create different variables for the changeable aspects of the site.